It's the US' attempt at a break-out big money hit! It's quite good fun, although not as much as the ratings seem to suggest. Here are the titles. As usual for this sort of thing, it begins with the announcer explaining the basic game over a montage. 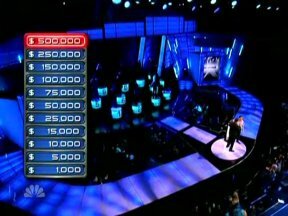 The show's first run was stripped daily over a week like NBC did with Deal or No Deal. Here's our host Penn Jillette (the best a man can get), the speaking half from comedy magic duo Penn and Teller. "What can you tell about someone just by looking at them? Are looks decieving, or are first impressions usually correct? 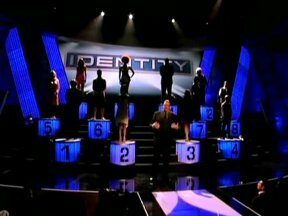 Tonight, if someone can identify twelve strangers, just by looking at them, they'll win half a million dollars... here, on Identity!" Here's our first contestant! He's Herb, and he's a private investigator. In theory he should be quite good at sizing people up, then. It's time to meet the strangers. For this bit, everyone tends to "do" and hold a pose which may or may not be relevant to their identities. Occasionally there is a celebrity in the identity parade, but chances are the trait associated with them won't be obvious. Several also provide short voiceovers giving extra facts about themselves. Because hey, they're more than just a pretty face. And here are the twelve identities. All Herb has to do is match the twelve traits to the twelve Strangers just by looking at them. 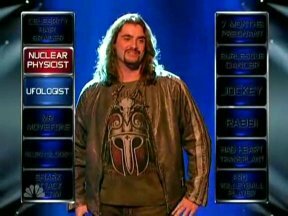 Can you tell what a nuclear physicist looks like? Or someone who's had a heart transplant? It's like a jigsaw, but can Herb piece it all together? 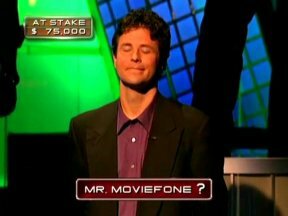 Moviefone is something you can call up in the States and get local film times, the voice for it is quite famous apparently. 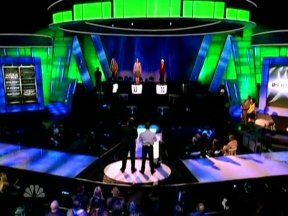 Here are the identities looking quite Deal or No Deal like. 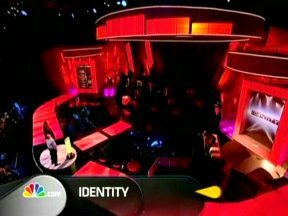 Everytime Jillette mentions an Identity, a shine runs across it with a small sound effect. There are usually two gimmes. 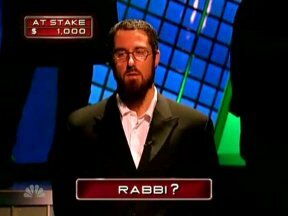 He's going straight for the rabbi, and thinks this is the stranger the identity belongs to. He places he palm on the handprint thing to turn it green and to seal in his answer. It is! Our strangers normally say something cheesy relating to their identity when the guess is correct. There's a lot of thinking aloud in this game, the graphics reflect this. 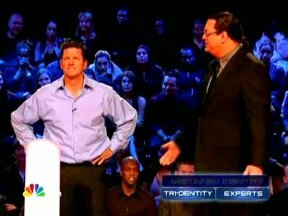 When the contestant gets two correct, Jillette reveals the three helps the contestant has at their disposal. 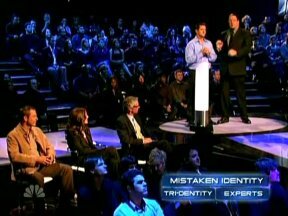 Mistaken Identity is effectively a second life, so the contestant is allowed to make one mistake (unless they still have it when they get down to the final two). 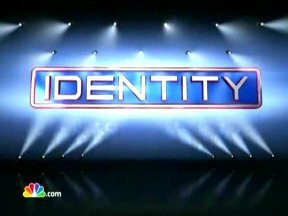 In Tri-dentity, the contestant picks an Identity, and the choice is narrowed down to three strangers. Or he can ask the experts sitting in the pit there, a body language expert, a psychologist and a member of the FBI. We have no idea what would happen if they get an identity wrong before this point. After some identities have been guessed a small fact box comes up. He's short and male was the correct reasoning behind being named the jockey. After four correct guesses, the friends and family are bought out to offer advice. And now the mistaken identity is gone. Now if he makes a mistake he leaves with nothing. However, he can quit and walk away with the money at any time. He's going to ask the experts. He picks an identity and each expert individually gives their reason as to which Stranger they think it relates to. The contestant doesn't have to take their advice. 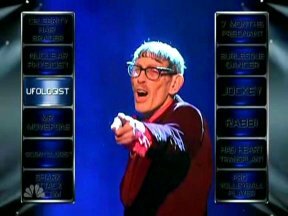 He's asking them which one they think is the Scientologist. Two of them think it's one person, the third thinks it's another. 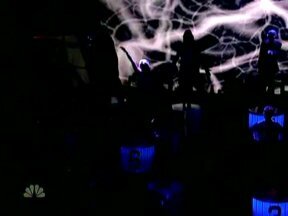 She's Hawaiian, they have sharks there, she's the shark attack victim. Correct! 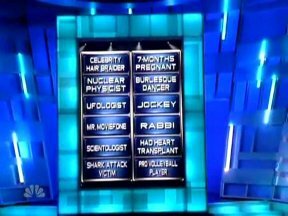 He's up to $75,000 and five identities to go. 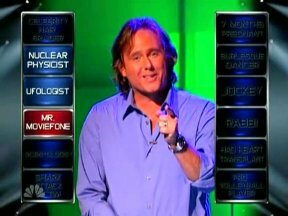 He's using his Tri-dentity option trying to find out who the nuclear physicist is. It's been narrowed down to those three up the top. 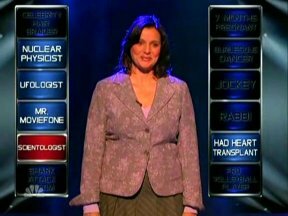 The final five identities are run down, two of the experts were correct in suggesting this woman was the scientologist. 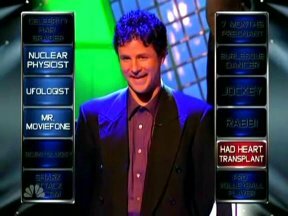 The man who wasn't Mr Moviefone has had a heart transplant. And it seems so obvious now, this man is a UFOlogist. If a game finishes, another game will play in the same show. 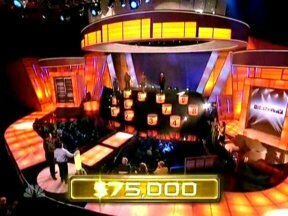 It's interesting to note that at the time of writing, six episodes have gone out and the $500,000 top prize has been won twice.